This is my 22nd installment in my Man Crush Monday meme. Since I read mostly romance, I thought I’d share some of my “book crushes” with you, and possibly introduce you to some new reading material. My Man Crush Monday for this week is Jack Sheridan from Virgin River by Robyn Carr. Synopsis from goodreads.com: “Wanted: Midwife/nurse practitioner in Virgin River, population six hundred. Make a difference against the backdrop of towering California redwoods and crystal-clear rivers. Rent-free cabin included.” When the recently widowed Melinda Monroe sees this ad she quickly decides that the remote mountain town of Virgin River might be the perfect place to escape her heartache, and to reenergize the nursing career she loves. But her high hopes are dashed within an hour of arriving: the cabin is a dump, the roads are treacherous and the local doctor wants nothing to do with her. Realizing she’s made a huge mistake, Mel decides to leave town the following morning. I LOVE Jack Sheridan. 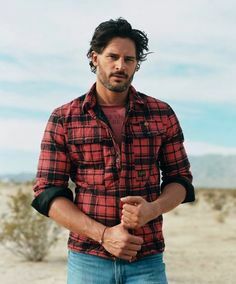 I kind of picture Joe Manganiello as Jack, in that tall, beautiful lumberjack way. Jack is a total alpha male, and he takes care of the people of Virgin River. Though he is the hero of the first book, he makes an appearance in the rest of the series (though I only read up to #12). Jack is a man’s man, but also a very loyal, caring lover. He’s an all around great guy and Virgin River is a great place.